← What is the Sea Breeze? A spectacular lightning display over Quebec. Among nature’s most spectacular phenomena is lightning. 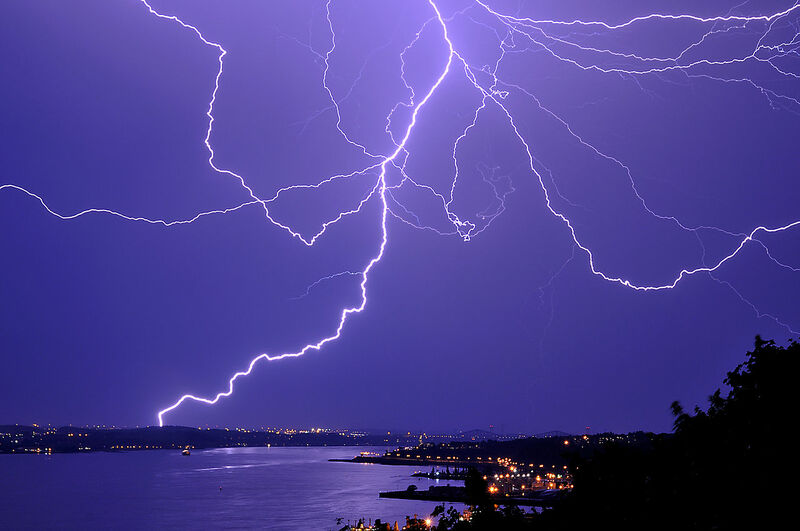 Lighting up skies throughout the world millions of times per day, coming in bright flashes and brilliant bolts. What causes this amazing spectacle? It’s all about electrical energy. 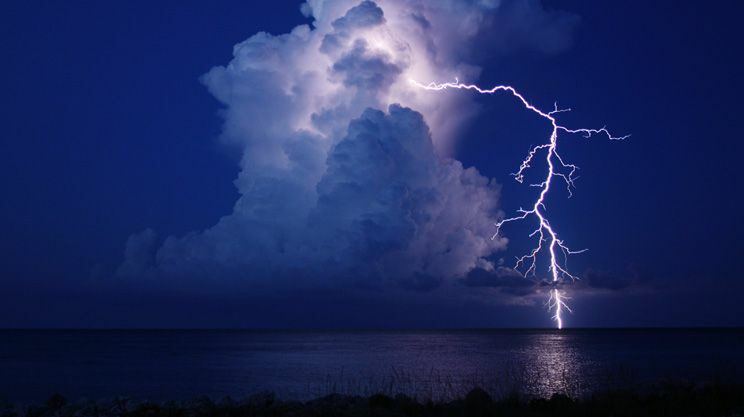 There remains some debate about exactly what happens, but the basic theory is that essentially an electrical circuit develops between the thunderstorm and the ground, as well as within the cloud itself. Inside a thunderstorm, strong updrafts heave water droplets high into the air, where they freeze into ice pellets. Downdrafts then hurl these ice pellets back down toward the surface. On the way, they run into other water droplets that then freeze on contact as well as other ice pellets that freeze together. This is how hail forms. These collisions cause electrons (which have a negative charge) to break off of drops going up in the updraft and collect on the ones coming down in the downdraft. This gives you a positive charge at the top of the cloud and a negative charge at the bottom of the cloud. In this graphic, you can see how the most common forms of lightning develop and how the charges are distributed. Remember from high school science class: opposites attract. When you have a difference in charges, it can form an electric field. This is what happens in storm clouds. An electric field develops between the top and the bottom of the cloud. Fortunately for us, the atmosphere is a pretty good insulator, which prevents the sky from lighting up like a Christmas tree with every shower (during the Carboniferous Period roughly 300 million years ago, the atmosphere was much more oxygen rich than it is today, which made the atmosphere much more sensitive to electric charge, producing frequent spectacular thunderstorms unlike any we see today). Because of the insulating effects of the modern atmosphere, an incredible amount of charge has to build up in order to produce lightning. As the updraft strengthens, the charge increases. Eventually it builds up enough to overcome the insulation and you get lightning. This is of the intracloud variety where lighting occurs within the could itself. 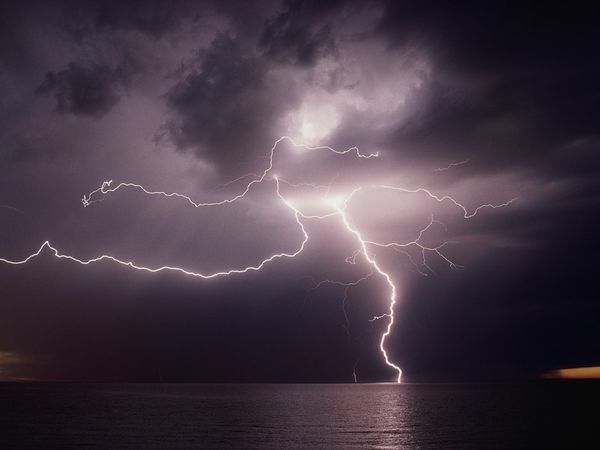 Lighting can also run between two different thunderstorm clouds, between the positively charged top of the cloud and negatively charged bottom of another. This is cloud-to-cloud lightning; bolts that snake across the sky. An animation showing how traditional cloud-to-ground lightning forms. How does that lightning get to the ground? As the thunderstorm moves, a positive charge builds up on the ground underneath it. Meanwhile, a string of negative charge begins to descend from the cloud. This is called a “stepped leader.” As the charges strengthen, the positive charge on the ground envelopes ground features such as trees, telephone poles, even houses. The charge climbs up as the leader drops down until they meet in a brilliant bolt of lightning. The reason prominent objects, like trees and tall buildings, are at higher risk is because they effectively decrease the distance between the cloud and the ground, thus requiring less energy to produce a lightning strike. Lightning, as with many things in nature, tends to take the path of least resistance. That doesn’t mean lightning will always strike the tallest object. Exactly what causes lightning to strike a specific place at any given time is something of a mystery, but it’s always where the charge is the strongest, be it a tall tree or a flat field. There are some objects, like metal poles, which are better conductors of electricity and may be more likely to get struck even though there might be, for example, a much taller tree nearby. After an initial lightning strike, if there’s enough charge left over, additional strikes can follow the same path. If you’ve ever seen a lightning bolt that flashed more than once, that’s what’s happening. Sometimes little pieces of charge can extend out, away from the main channel, which is what causes the little forks of lightning we occasionally see. 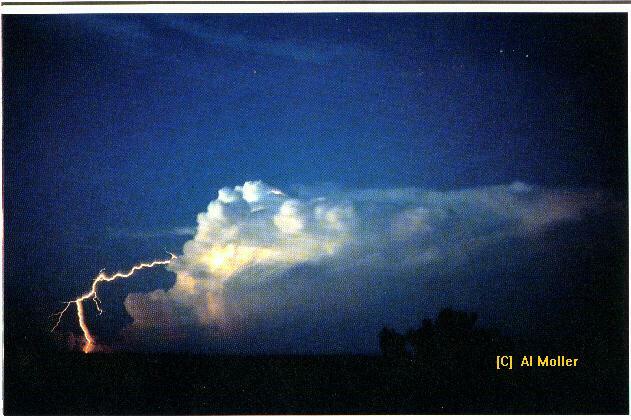 This spectacular image taken by the late meteorologist Al Moller in 1976 is an excellent example of a positive lightning strike. 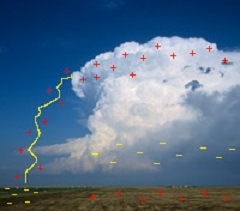 Diagram showing a typical example of a positive lighting strike. Another incredible shot of a positive lightning strike. What about thunder? How is that created? Well, lightning is extremely hot, as much as 30,000 degrees Celsius (54,000 degrees Fahrenheit)…five times as hot as the surface of the sun! The air we breathe is a gas, and when you heat gas up, it expands. A lightning flash superheats the air around it instantaneously, causing the air to explosively expand beyond the speed of sound and create essentially a sonic boom. Light travels WAY faster than the sound, which is why you see lightning long before you hear it. When the lightning strike is close by, it sounds like a loud boom or crack. This means you’re close enough to hear the single initial shockwave. When you’re farther away, the sound waves blend together and create more of a prolonged rumble. Temperature also makes a difference. If it’s warmer outside, the sound waves travel faster and thus you will hear thunder sooner. When it’s cold out, the sound waves are slower and take longer to reach your ears. The above video shows a lightning strike slowed down frame by frame. You can see the initial strike with branching, followed by a return stroke (the secondary flash). Roughly a hundred Americans are killed by lightning every year. How do you stay safe? Well first, I know it sounds kind of obvious, but don’t be outside in a thunderstorm if you don’t absolutely have to be. All that does is add risk. If thunder roars, go indoors! If you hear thunder, you need to find your way to a safe place. If you are outside and there’s no public building or other shelter nearby, getting in your car is the best option, but any sort of open vehicle like a convertible or golf cart isn’t safe. But most importantly, always keep an eye on weather forecasts whenever you’re planning outdoor activities and always have an idea of what you will do if there’s a lightning threat. Lighting is spectacular display but it is also very dangerous and must always be treated with respect. This entry was posted in Uncategorized and tagged lightning, nature, science, weather. Bookmark the permalink.